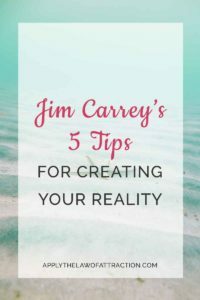 Jim Carrey often speaks publicly about his belief in the Law of Attraction. He is most well-known for describing on the Oprah Winfrey Show how he used creative visualization and abundance checks to propel himself from being broke to earning $10 million per movie. However, Jim Carrey's Law of Attraction teachings go far beyond that moment on Oprah. The Law of Attraction involves more than just spending a few minutes visualizing your goals. As Carrey explains in the video below, it's the entire creation process that manifests your desires. You have to believe it and take action towards your desire. You can ask the Universe for anything you desire. Nothing is out of reach. Nothing is too big or too small. Don't let fear stop you from asking, or limit you from asking for everything you want. The world is your oyster and you are its pearl. There's nothing to control with the Law of Attraction. If you want to get married, you don't need to decide how every date will go or what every text message will say. You just need to work towards your goal of getting married, while letting the Universe decide how you'll get there. Carrey explains the Law of Attraction as a lesson on how to live your life in this commencement speech. It's filled with tip after tip on how to create your reality. There's an old idiom from the 1600s – “Seeing is believing.” But with the Law of Attraction, it's actually believing is seeing. Once you believe something, then you'll see it. You can spend endless hours visualizing, reciting affirmations, or making lists. But as Jim Carrey points out, it's when you believe it that you'll get it. I think it would be fun if there was an article where you challenge us to manifest specific things and we post our different success stories in the comments section. I’m looking to increase my belief in my ability but I can never think of things to manifest other than stuff I’m really attached to! Just an idea 🙂 it would be interesting to see how the same things manifest in different ways! Elizabeth has done games like this in the past for things like cups of coffee. You should check the archives and try those. You can also make your own challenges. Pick something fun and unimportant like blue ribbon or green cups. Is this the book you’re referring to E-Squared: Nine Do-It-Yourself Energy Experiments That Prove Your Thoughts Create Your Reality by Pam Grout? The book sounds like a post that I was referring to. I’ve read the coffee post. I was thinking a post that gives more than just one thing. Thanks for all of the responses. 1. HOW do you ask the Universe for what you want?? 2. How do you get to the point of believing? Is that part of changing your paradigm of thought? Love your site Elizabeth. Really cool site! I am learning a lot so far. I looked for information on your site about asking and believing. Couldn’t find the information, so forgive me if I missed seeing an article relating to that.